Persistent pain might seem tricky to manage but there are a number of things you can do to help yourself, depending on the type of pain and the other symptoms you are living with. Distraction techniques such as the breathing exercises detailed below, and relaxation and guided imagery detailed on the next page, can help you to manage the pain. Many people find that Cognitive Behavioural Therapy and Mindfulness (Also discussed over the following pages) can be helpful in reducing the emotional impact of the condition. As with any new technique, it will take practice to master, so don’t give up if something does not work for you the first time. Research has also suggested that graded exercises and certain manual therapies such as osteopathy may stimulate the body to produce strong natural painkillers (endorphins) that can be of benefit. Finally, pacing your activities can also help to reduce the likelihood of a flare-up of symptoms. Where over the counter medications are ineffective in persistent pain conditions, GP referral to a specialist pain management team may be appropriate. There you can expect your current medication to be reviewed and the team of clinicians will try to identify something that is more likely to work for you. As discussed above, there are lots of things that you can try to help you to manage the physical and emotional effects of persistent pain. The following sections, written by an osteopath, outlines in more detail some of the techniques that you may like to try and might find useful. Dwelling on your symptoms and how they make you feel emotionally can lower your mood and make the pain seem worse. Conversely, intentionally focusing your mind on other things can positively influence the way in which your body copes with pain. 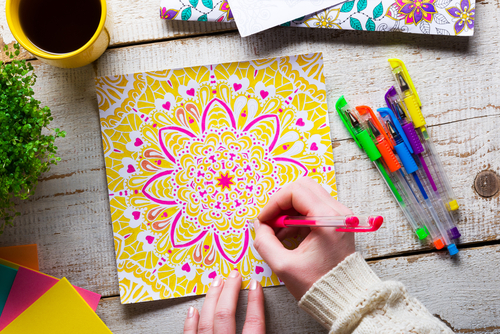 Short term techniques might include colouring in, reading, watching TV or listening to relaxing music (also see visualisation). Some people find concentrating on something like a crossword or gardening also helps. Longer term strategies require a greater psychological investment, and these might include joining a social group, taking up a new hobby or taking on a voluntary role. Many people say that even a few minutes of being distracted from their symptoms can really help. Relaxation techniques which includes breathing exercises, progressive muscle relaxation, guided imagery and meditation – can decrease your blood pressure, muscle tension and help you to manage your pain. When we are in pain, our breathing often becomes more shallow and we can develop tension in our shoulders, chest and upper back. However, if we purposefully concentrate on doing deep breathing exercises, it can reduce our physical tension and help us to feel calmer. Lie down or sit comfortably in a chair. Your body should be as relaxed as possible. Close your eyes if you wish. Try to make sure that your shoulders are down and keep them relaxed. Place one hand on your chest and the other over your bellybutton. Breathe gently and slowly and notice how your hands rise and fall. Tension in your upper chest will make this area move more and you should try to keep this movement to a minimum. Instead, you should feel your bellybutton raise when you breathe in, and fall when you breathe out. If you are finding it difficult to feel this initially, you might wish to try standing in front of a mirror and watching for the movement first of all. Breathe in deeply and slowly for a count of four and then hold your breath for one second, before breathing out over a count of four. Some people suggest breathing in through your nose and breathing out through your mouth helps. As you breathe out, listen to the sound of your breath and feel the tension in your body reduce. You can practice deep breathing for a few minutes every day and once you feel confident, you can use the techniques to calm yourself in other situations. The aim of this exercise is to concentrate on reducing tension in specific parts of the body, by consciously tensing and then relaxing the muscles in each area in turn. Lie down or sit comfortably in a chair. Your body should be as relaxed as possible. Close your eyes if it helps you to relax. Visualise each area of the body in turn and intentionally tense that area for a moment before relaxing it, beginning with your forehead. Raise your eyebrows for a moment. Be aware of the feeling of tension in the area, breathe gently and then when you exhale, let the forehead relax. Squeeze your eyes shut and clench your jaw. Again hold this for a moment, before letting the tension slip away as you exhale. In the same way, shrug your shoulders, followed by stretching out your fingers, straightening the legs at the knee and then stretching out your toes, holding each for a moment in turn before consciously letting go. You may choose to repeat this a few times before lying quietly for a while, or before going to bed at night to help you sleep.